Sitting back in a cafe, I slowly sip my daily fresh orange juice and reflect back on my first day in Fes, Morocco. There were very interesting sites such as the Mosques, the oldest University in the world (founded in 859), the pottery/tile makers, the leather tannery and the silk weaving, but my favorite part has been watching the salesmen and con artists at work. The day started by meeting the tour guide that an Aussie and I had arranged. The guide was excellent (he deserves his own seperate post) and besides the sites listed above, he took us to a Moroccan rug shop. My fellow traveler saw each rug and had absolutely no interest in purchasing anything, and yet was talked into purchasing not one, but two rugs (I didn't ask but this most likely set him back around $600). "I can sell you as many new rugs as you want and you can sell those for profit, but you have to promise not to sell any of the antique Berber rugs. These you must keep for yourself. They are too special and unique." "People pay for their trips by selling these rugs in their home countries. You can get 10x as much money as you paid for them here. Macy's and Nordstroms sell rugs of this quality for thousands of dollars!" "This is a co-op where the money is given back to the widowed women workers who make these rugs." "I teach you two Arabic phrases as we look through the rugs. 'put away' and 'keep for aside for later'. You tell me one of these Arabic phrases for each rug we go though." The Aussie makes the mistake of nibbling on the bait "how much does this one cost? ", and Abdul quickly yanks back on the line and starts slowly reeling in. Within 7 minutes, he's been netted. Good catch Abdul. Abdul could find no counter argument for my "I do not spend money that I don't have, and I only have enough money for this trip". As the Aussie is being driven back to his hotel to get his credit card, I chat with Abdul about his business and sales techniques. While the souring economy has hurt his business, he still nets 60% of the people who come into his shop. Very impressive. An hour and a half well spent. Instead of buying a rug you need to get a Fez cap. You won't have to carry it or ship it. Just wear it on your head. I am SO enjoying this blog & am thrilled that it is all so exotic! Funny, I had a similar experience in Delhi...I think tourists have dollar signs in their eyes. So I guess this means we won't be getting that rug we talked about? Good to see you're having a great time. 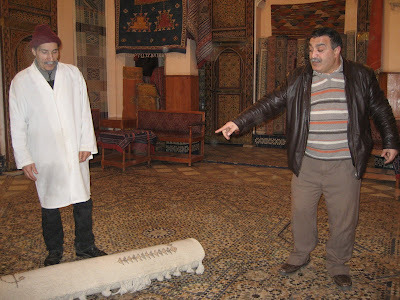 Your story about the rugs reminds me of (foolishly) trying to negotiate for two small prayer rugs in Turkey. From reading your blog you are now the expert NEGOTIATOR, William Shatner, please move over.